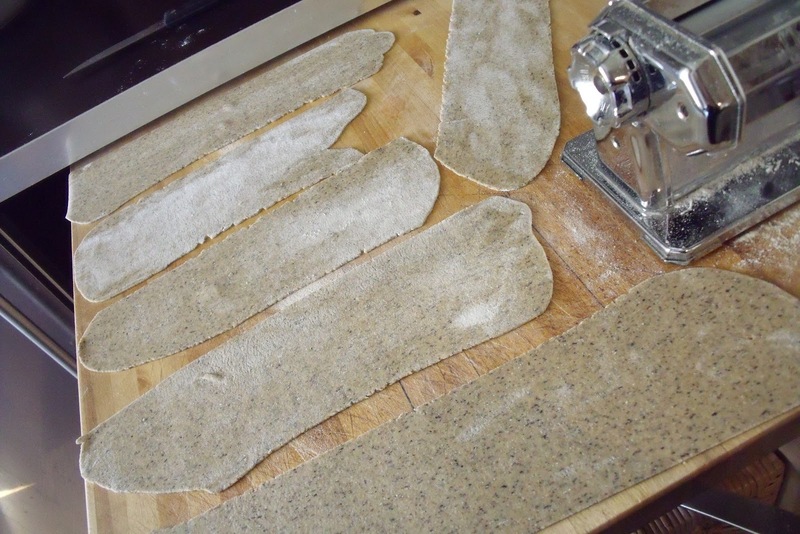 I used to think that making home made pasta ("homemades" if you were raised in South Philly) was really a long and drawn out process, but I realised that the long drawn out part was related to the quantity of pasta you have to make! Now that my kids have flown the coop and it's just Franco and me, making home made pasta is really a snap. Usually 1 large egg and about 1 cup of flour is more than enough for the two of us. 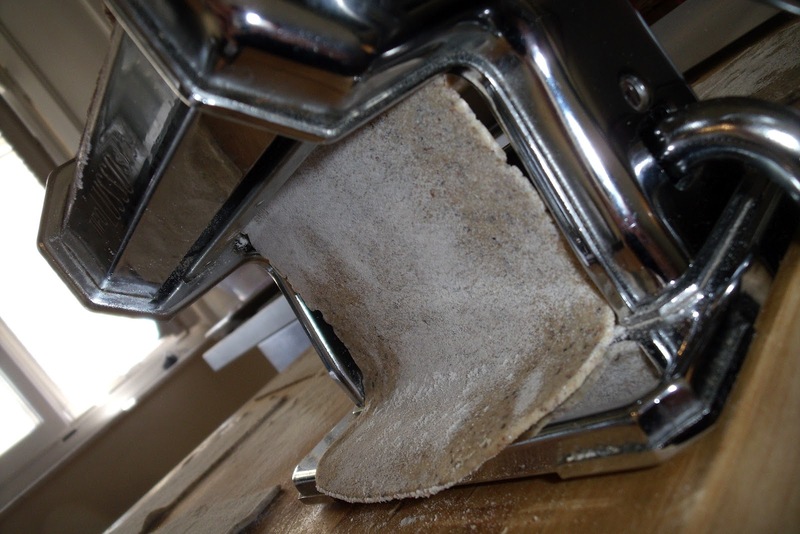 And if you are really lazy you can throw the ingredients into a food processer - et voilà - your dough is done in about a minute! And if you have a pasta machine, it really only takes 30 minutes or less from start to finish. I am not talking about electric extruder type machines that can cost over a hundred dollars, but one of those stainless steel manual machine that rolls and cuts your dough into either narrow (tagliolini) or wide (tagliatelle) ribbon noodles. You can buy one in the housewares section of most department stores. What I love most about cooking, aside from the delicious results, is the creativity! Once you learn the basics, you can pretty much wing it and mix ingredients and ideas to come up with your own particular twist to an old recipe. 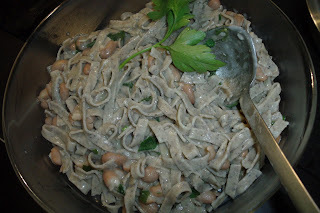 Today I decided to bring together two really traditional dishes to create my own version of pasta and beans, using pizzoccheri instead of the more traditional durum wheat pasta. Pasta e Fagioli - pasta and beans - is a traditional meatless Italian dish. Very hearty and very healthy. It can be fixed in a variety of ways, depending on the regional recipe you choose. It can be rather brothy and eaten with a spoon, or quite thick in consistency and eaten with a fork. My father-in-law, being from Campania, followed the Neapolitan tradition and cooked the pasta with the beans, resulting in a thick, hearty one dish meal. I prefer my pasta and beans "in bianco" - that is with no tomato sauce added. I season it with extra virgin olive oil, lots of garlic and chopped fresh parsely. I love home made pasta. 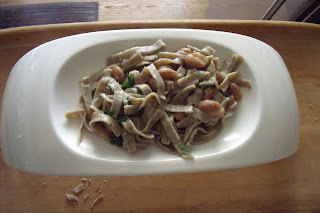 I particularly love "pizzoccheri" which are short ribbon noodles made with buckwheat flour and are typical of the Lombardia region of Italy, more specifically the Valtellina. 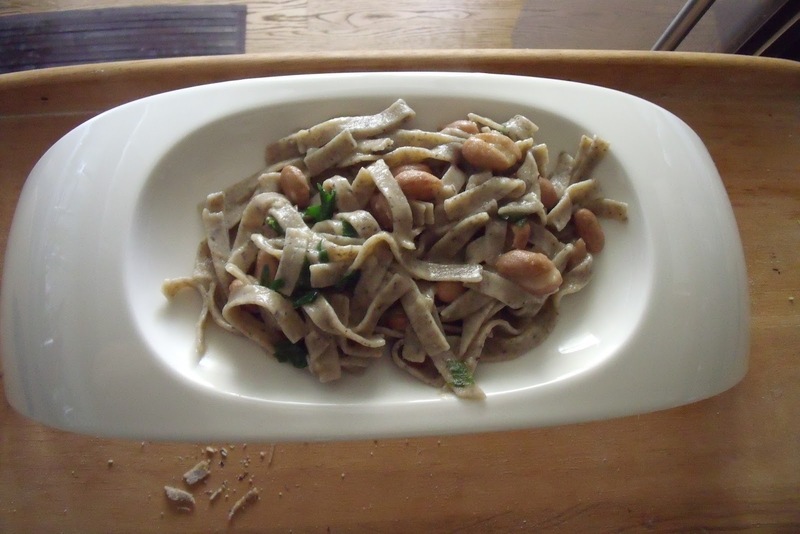 It is a traditional pasta with a very long history, probably dating back to the mid 1500s when buckwheat was first introduced into the Valtellina area. Buckwheat is grano saraceno in Italian, used to make buckwheat flour - furmentùn or farìna négra - in the local dialect. Now the traditional recipe for using pizzoccheri is very rich and includes cabbage, lots of butter, 2 or 3 types of fatty local cheeses and potatoes. But today I am making them with beans! If you are starting with dry beans, you should start the night before and soak the beans overnight. Then the next day, cook them until done. Season with salt, pepper, olive oil, garlic and parsely. 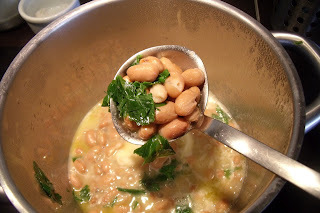 If you are using canned or fresh beans, they don't need to be soaked over night. 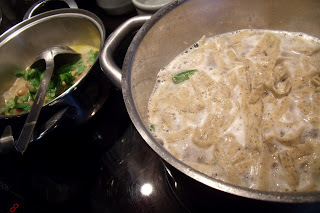 Rather than the typical pizzoccheri made with white flour, buckwheat flour and warm water, I opted for making them with 2/3 cup buckwheat flour, 1/3 cup semolina flour, 1 large egg, 1 T olive oil, and water as needed. I mixed together the flours, the egg and the oil to obtain a rather stiff dough. I added about a tablespoon of warm water as I was mixing because the dough was a bit too stiff. You need to work the dough about 5 minutes by hand. 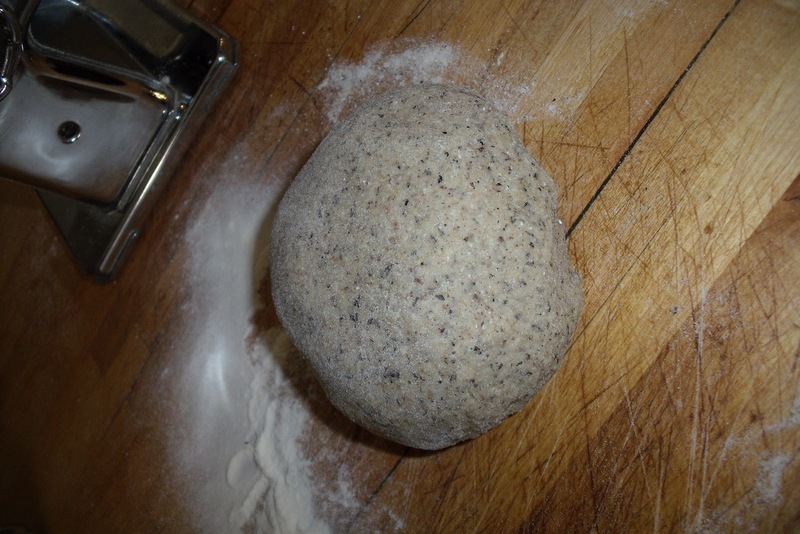 If you have a food processor or kitchen-aid go ahead and use it to make the dough. Let the dough rest for about 10 min. 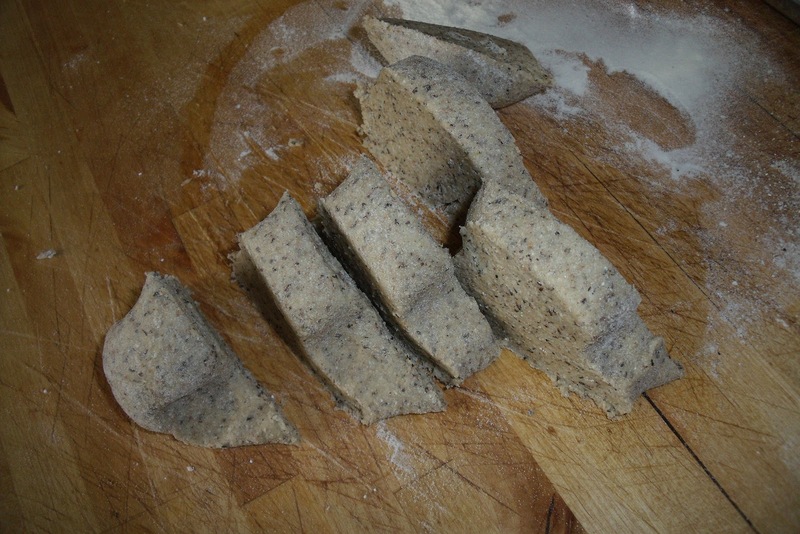 I cut my dough in several pieces before I start rolling it out, to save time as I go along. We are looking for a rather thick noodle. My pasta machine can roll the pasta out to 8 thicknesses. For these noodles I stopped at the 5th thickness setting. I usually roll all the pieces on one setting, and then go on to the next, and so on. This way I don't have to keep resetting the thickness. 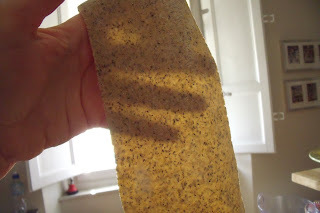 The sheets of dough should be "translucent" and about 1/4" thick. When all of the sheets have been rolled out to the right thickness, cut the sheets in to about 4" lengths. We are looking for a short noodle that will amalgamate well with the cooked beans. 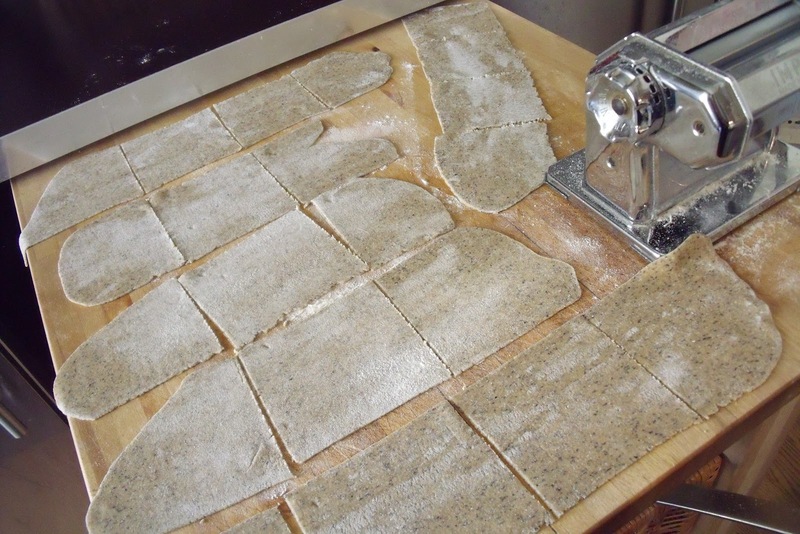 I usually let the sheets of dough dry for about 10 to 15 minutes before cutting them so the noodles don't stick together. At this point put a large pot of water on to boil. 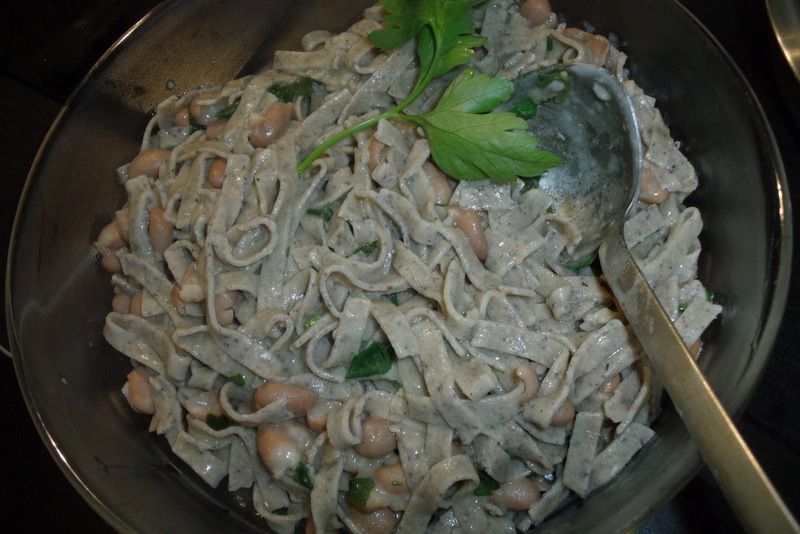 I don't cook the "homemades" together with the beans because the results would be too starchy. 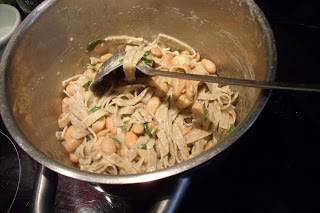 I cook the noodles separately for about 1 minute - that's all fresh pasta takes - and then add them to the beans and cook for about another 30 seconds so all of the flavours blend together. Drain the noodles and add to the beans, stir over high heat for about 30 seconds, taste and correct the seasoning. You may need to add some more extra virgin olive oil. That's it! And as Julia Child would have said had she spoken Italian... BUON APPETITO! You are making me hungry and thoughtful. We love pasta/beans, Joe especially, white ! We will have to have them for pranza while we are visiting.